Really genius poetry that sparkles, just like ice. It's like drinking art. Per the norm for me, Wakoski starts out fairly interesting, then her poems begin to devolve into pure language poetry, a form I do not really care for. I would prefer to read poetry that is a bit more easy to decipher, I don't mind fresh, interesting metaphors and similes, but if the entire language of the poem is what I term: "too inner" I begin to think the poet is grasping, and most definitely simply putting words together to sound clever. I will admit there are some language poets I respect and do read, Wakoski has never been one for me. The more I read, the more I felt as if she were attempting to sound like Plath, but came up pale in comparison. I began to read Wakoski in undergrad poetry workshop, because my professor commented that my poetry reminded him of her, and he advised that I read some of her work. I have tried several times over the years, but invariably lose interest. She does indeed have some lovely work, but ironically enough, I feel her poems are a great deal like mine, several jewels amongst mediocre/middling good works. Not really a poetry reader, but despite the crazieness, I found Wakoski fun to read. Diane Wakoski - Wakoski is an American poet who is primarily associated with the deep image poets such as Jerome Rothenberg, Robert Kelly, and Clayton Eshleman. Throughout her work she uses legends, myth and fairy tales to create a deeply personal mythology.She is best known for a series of poems collectively known as "The Motorcycle Betrayal Poems." 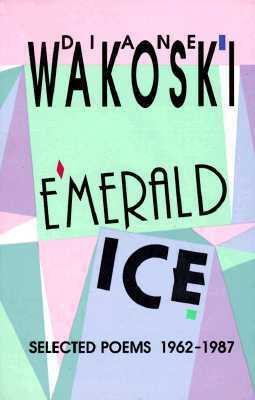 Wakoski was given the William Carlos Williams Award for her "Emerald Ice: Selected Poetry 1962-1987."